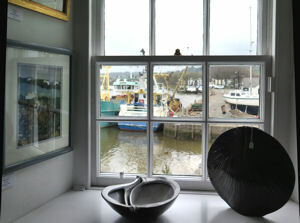 More than 800 visitors viewed the society's two-week spring show at Harbour Cottage Gallery, Kirkcudbright, which ended on Saturday, April 13. Six of the 80 or so works on show were sold, plus a number of cards. 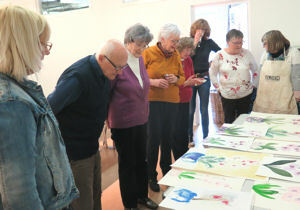 Philippa Sinclair followed up her demonstration of watercolour techniques by tutoring a workshop for members at Gracefield on Friday, March 29. 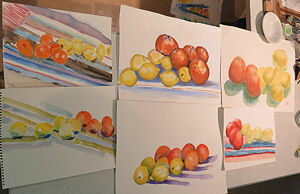 These paintings of oranges were not the only fruit of the workshop - the participants painted flowers as well. Below: assessing the results with Philippa (on the left). This was the last of the autumn/winter season of demonstrations and workshops. Information about the society's summer programme of workshops is available in the spring edition of the magazine, which members should have received by now, and on the Programme page of the website, where you can download the details and a booking form.